Please note: the following page reflects a past CoR Network campaign and may be out of date. The Cultures of Resistance Network has long stood in solidarity with indigenous Kayapó opposition to the Brazilian government’s Belo Monte Dam on the Xingu River in the Amazon. The dam, currently under construction, will have a disastrous impact on the Kayapó homeland. 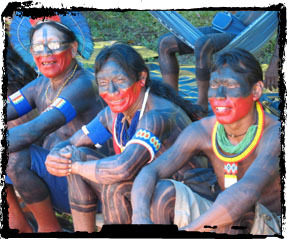 CoR Network director Iara Lee and her team first joined the struggle over the dam at the 2008 Altamira summit, a key moment of the burgeoning Kayapó movement, when 1,000 Indians joined national and international supporters in the city of Altamira, Para to protest the Belo Monte Dam project plans. It was the largest indigenous gathering in the Brazilian Amazon in nearly twenty years. As part of CoR's past support for activists in the region, Iara Lee published an article at the Huffington Post that examined the local, national, and international resistance to the Belo Monte project as well as the flawed thinking behind the many mega-dams around the world. She also published an updated version of the article on the Video for Change blog at WITNESS, an organization that was formed to harness the power of video for human rights advocacy. Meanwhile, Lee and her team at Caipirinha Productions produced a short film about the Altamira summit and the movement surrounding it, entitled "The Battle for the Xingu." To learn more about this momentous struggle for indigenous rights to land and water in Brazil, read on. Many specialists from across Brazil and abroad—including economists, engineers, and environmental scientists—have made it clear that Belo Monte is an ill-conceived dam. While the government estimates the project’s total price tag at US $8.7 billion, independent assessments have put the number around $17 billion, while numerous private corporations have lost interest in investing. Indeed, state-owned, taxpayer-financed companies account for approximately 75% of the recently signed concession. The dam’s technical viability has also been called into question. Coronado Antunes, ex-President of the state-owned water and sanitation utility Sabesp, was quoted in the July issue of the Journal of the Brazilian Engineering Institute calling the dam "the worst engineering project in the history of hydroelectric dams in Brazil, and perhaps of any engineering project in the world." According to independent evaluations, during the seasons and years when the river’s flow is below its peak, the dam will generate far less than what government and industry proponents have touted to the public. Quoting Antunes again, "in years of low instream flow, Belo Monte will be disastrous." Besides the economic and technical issues, and the thousands who would be forced from their homes due to flooding, less-obvious impacts abound. Fresh water would be significantly less available; fish species would be decimated; water-borne diseases like malaria would skyrocket. According to a World Wildlife Fund study, Brazil could cut its projected electricity demand by 40% by the year 2020 through energy efficiency initiatives alone—the equivalent to 14 dams the size of Belo Monte. Meanwhile, approximately 30% of the dam’s generated power will go to heavy industry like mining companies, which themselves are some of the world’s worst polluters. We at the Cultures of Resistance Network think International Rivers is one of the best groups working to protect rivers and the people who depend on them, particularly the Xingu. Founded in 1985, the group has worked to encourage more efficient ways of meeting the world’s water and energy needs. The International Rivers network includes environmentalists, human rights activists, ecological and industry experts, as well as individuals who are directly affected by the building of large dams. In their review of the Belo Monte Dam project, International Rivers experts reported that “although it would have an official installed capacity of 11,233 MW, the dam would be highly inefficient, generating as little as 1000 MW during the 3-4 month low water season." They concluded that the irreversible, harmful impact of the dam would greatly outweigh the economic value of the energy it would produce. Those inspired by the activism in the short film should consider getting involved with International Rivers. • Writing to President Rousseff and other Brazilian government officials to say that the international community will not tolerate the destruction of the Amazon region’s ecological and cultural diversity. • Donating directly to International Rivers’ Xingu River campaign. • Joining the International Rivers mailing lists to receive updated information regarding developing issues, current campaigns, and future events. • Volunteering with International Rivers. The group needs volunteers in all areas of administration, and well as research, education, and advocacy. Volunteer opportunities are available to individuals of all ages and in many different regions of the world.